The Republican Party Is Eating Itself Alive. Blame That Sarah Palin. With Election Day exactly one year away, there is an essential truth in American politics that transcends all others: The Republican Party is eating itself alive and shows no sign of coming to its senses. This has become such common knowledge that the problem for pundits like myself in describing the party’s immolation — whether in the context of vacuous presidential candidates, farcical presidential debates or an out-of-control presidential primary process — is to somehow sound new and different. And wonder all the while why the heck the party is unable to check its self-destructive behavior. That question is actually fairly easy to answer: The loyalists cognizant of the party’s parlous condition have been banished from its temple of political purity, and what has become paramount to the forces that now control the party is defending the five pillars of the temple — rank nativism, economic recidivism, nonsensical beliefs, an aversion to governing and pathological fear of change. This is more important than even winning big elections. After the drubbing the party received in the 2012 presidential election, a Republican National Committee commission called the Growth and Opportunity Project brought forth a brutally blunt 98-page report concluding that the GOP had become smug, uncaring and so ideologically rigid that it was turning off a majority of American voters with stale policies that had changed little in 30 years and an image that was alienating to women, minorities and the young. In a homecoming of a sort, the presidential clown car with be stopping over in Milwaukee on Tuesday for the fourth debate and the friendly embrace of sponsors Fox Business Network and Wall Street Journal, whose moderators hopefully won’t be asking the kind of questions like those tendered at the last debate that required real answers — not lies and distortions — and led to so much whining that the RNC has been booted from the debate process, which is like a surly child telling its parents to go to their room. John Kasich, in a fit of pique, asked the other day what had happened to the conservative movement. Kasich’s frustration about a political party where up has become down and yes means no is understandable. And he need look no further than the 2008 nomination of Sarah Palin for vice president to understand when and how the Republican Party left the rails. “Once John McCain put Sarah Palin on the ticket, Republican ‘grown-ups,’ who presumably knew better, had to bite their tongues. But after the election, when they were free to speak their minds, they either remained quiet or abetted the dumbing-down of the party. They stood by as Donald Trump and others noisily pushed claims that Obama was born in Kenya. And they gladly rode the Tea Party tiger to sweeping victories in 2010 and 2014. “Now that tiger is devouring the GOP establishment. Party elders had hoped new presidential debate rules would give them greater control. But they are watching helplessly as Trump leads the pack and House Republicans engage in fratricide. Daley may seem to be belaboring the obvious, but the deeply toxic effect that this narcissistic, power abusing kook and liar has had on the GOP still is not fully appreciated, and only barely so by historians as well as Republicans who mourn the destruction of the GOP Big Tent and the party’s descent into eating itself alive. Nor is McCain’s decision to invite Palin to join the ticket after spending less than two hours with her (his man in charge of vetting veep nominees never even met her face to face) properly understood to be the most irresponsible decision in the history of presidential campaigns. 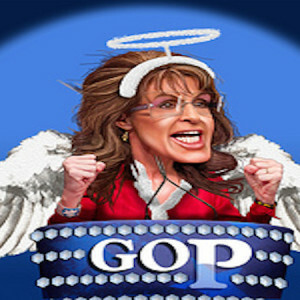 It is easy to blame Palin for the state of the party, because at first glance that’s a mixed bag. Republicans are rich in statehouses and state legislatures (and generally did well in last week’s off-off-year elections), firmly in control of the House and pretty much in control of the Senate. But the party is poor where it matters most. It is no closer to recapturing the White House than in 2012 and now arguably even further from that goal. As considerable as the party’s legislative and congressional successes have been, they have had much to do with gerrymandering and it is the big dance that counts the most. In that respect, the party’s record is awful because voters have elected Democrats in four of the last five presidential elections, not including the one thrown by the Supreme Court, prevailing by a 2-to-1 electoral vote margin (1,446 to 706). Palin is not the only reason for the Republican Party’s dysfunction, but her toxic lip lock is evident in the hapless 2016 presidential campaign. Sure, the field will narrow and there will be considerable sorting out. But it is the fat cats willing to bet buckets of money on their horse who are keeping so many unqualified people in the race. Some 55 percent of the party’s registered voters tell pollsters they support candidates who have zero experience in public service but still would entrust them with running the government, maintaining America’s place in the world . . . oh, and carrying around the nuclear football. Translation: A bit more than half of the Republican electorate insists that it doesn’t want a Jeb Bush, John Kasich or Marco Rubio, the only people who could conceivably challenge Hillary Clinton, and if Carson and Trump continue to lead the pack, there will be an irreconcilable split between the party’s donor class and the pitchfork brigade as the party takes another big bite out of itself. One of Paul Ryan’s first acts as House speaker was to pledge that Republicans would have nothing to do with a long festering issue that must be dealt with — immigration reform. Beyond this being yet another instance where Republicans duck their responsibility to govern, it means willfully ignoring a demographic tipping point that has now been reached as moderate-liberal whites and minorities become an insurmountable voting majority. Immigration reform is perhaps the most divisive issue between the party’s base and its more mainstream remnants as personified by the Spanish-speaking Jeb Bush, whose unraveling lifeline to survival is his establishment cred at a time when anti-establishment rage fuels the GOP. Ryan is no dummy, and he knows any vote on immigration will further divide the party and perhaps cripple it irretrievably on the eve of a presidential election year. Besides which, those pillars in the party’s temple of political purity must be defended. And so the devolution of one of the nation’s two major political parties is nearly complete, which along with the election of Barack Obama, has to be the most important political story of the modern era. And the most tragic. Editor’s Note: This essay originally appeared on November 8, 2015, on Kiko’s House, a website featuring commentary by journalist and author, Shaun Mullen. It was reproduced here with the consent of Mr. Mullen.